As aging progresses, excess fat accumulates in the tissues under the eyes or skin elasticity is lost. 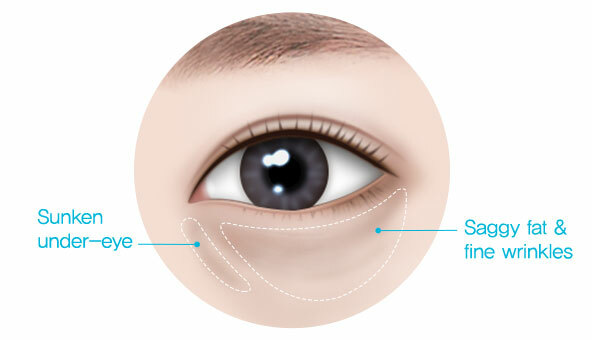 Depending on the individual, the under eye area may protrude or sink. If it’s left untreated, it becomes a major cause of fine wrinkles, sunken under-eye, and dark circles. Remove the protruding under eye fat! Rearrange the fat in the sunken area! Fix the orbital septum - strengthen! Removes fat and fix sagginess all at once. What is Dual under-eye fat rearrangement? 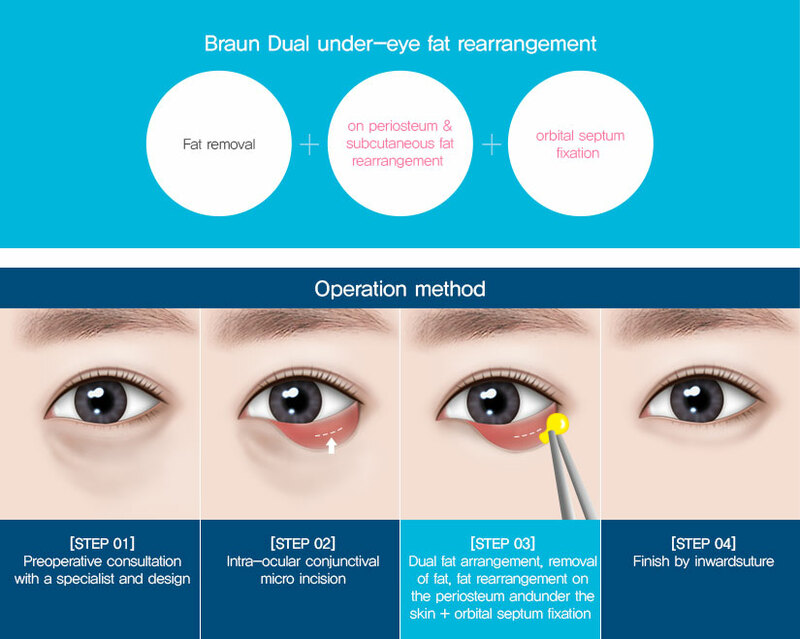 BraunDual under-eye fat rearrangement is a surgical procedure that removes dark circles without recurrence by < eliminating under-eye fat, rearranging fat in the sunken area on the periosteum, under the skin, and fixing the orbital septum. 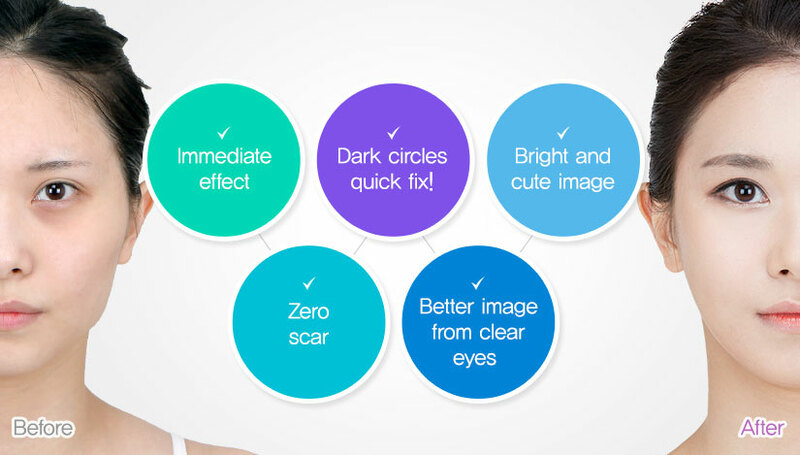 Transform into a lively face by giving firmness and volume to the under–eye. Fat rearrangement for 2 areas, upper periosteum and under skin to streng then septum! The dual under-eye fat rearrangement will brighten the under-eye and fix the orbital septum to add more elasticity to the eyes. Minimal incision in the conjunctiva in the eye. Since it is operated through the conjunctiva, it is not visible at all. 3. Side Effects? Rest easy! We thoroughly consider the individual eye condition through detailed consultation with professional medical staff with extensive clinical experience. We prevent even minor side effects that may occur after surgery. 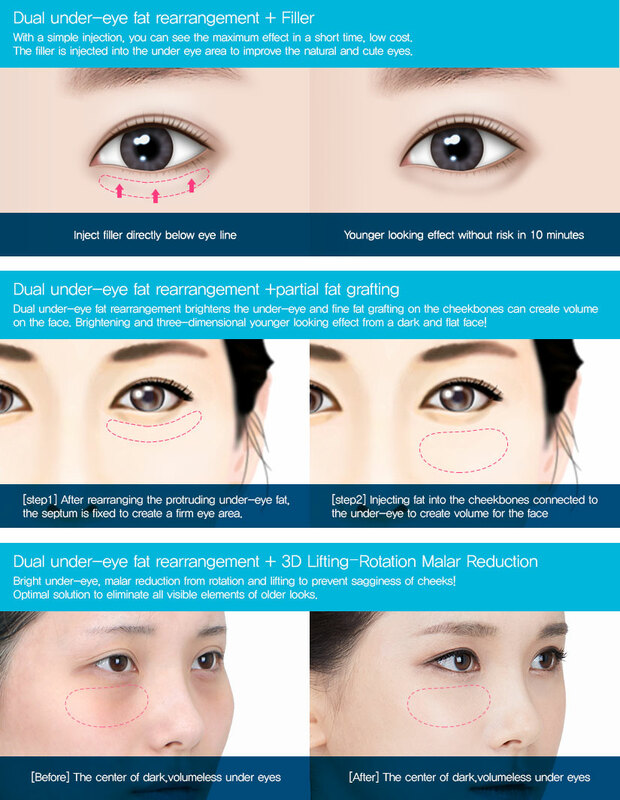 We effectively rearrange the fat under the eyes to make it harmonize with the face. 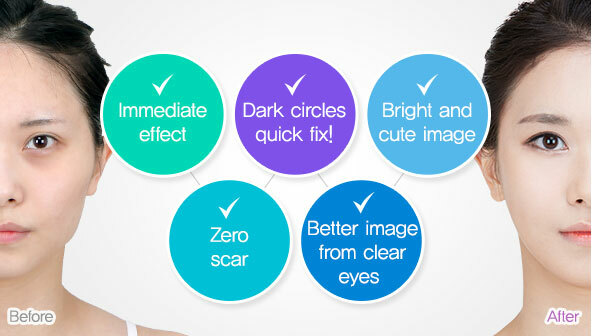 It removes dark circles as well as improves the elasticity under the eyes to change the image. We have shortened the operation time after a long study for quick recovery after surgery. There is no need for a special recovery period, so daily life is possibleimmediately. In the case of under-eye fat, it is more likely that it becomes protruding again as aging reduces elasticity. But with Braun's technology, you do not have to worry about recurrence because the under-eye fat is fixed to the lower part ofperiosteum. Bright dark under eyes that can’t be covered by makeup Transform into a lively face by giving firmness and volume to the under–eye.